Debut author Royce Prouty offers a spellbinding tale of history, folklore, destiny, and redemption. Reviewed by Dacre Stoker. 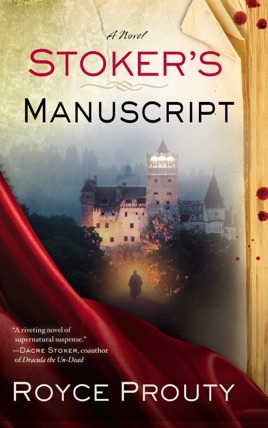 Prouty s debut, a riveting novel of supernatural suspense, deftly mixes fact and fiction involving the manuscript of Bram Stoker s great vampire novel, Dracula (1897). In present-day Chicago, rare book dealer Joseph Barkeley receives a phone call from a gentleman with an Eastern European accent who wants him to authenticate Stoker s original Dracula manuscript, which is due to be sold at auction by Christie s. An anonymous client wishes to buy the manuscript. Barkeley eagerly agrees to the caller s terms. A successful bid on his client s behalf will mean a generous commission for him as well as a trip to Romania, which happens to be Barkeley s birthplace, to deliver the manuscript. During his research, Barkeley learns the circumstances of Dracula s publication were not without controversy. Stoker planned to publish a prologue and epilogue with Dracula, but for some reason did not. The content of Stoker s missing text remains unknown. The many parallels between Stoker s Manuscript and Dracula range from subtle to overt. The unassuming Joseph Barkeley, who becomes a reluctant vampire hunter, resembles Jonathan Harker in more than name. Just as Bram s band of heroes used new technology of the late 19th century (telegrams, phonographs, and blood transfusions) to counter the supernatural forces of Count Dracula, so does Barkeley use a GPS unit to locate ancient graves, which inexplicably the vampires cannot find on their own. Prouty seamlessly blends his new vampire characters into the well-established Transylvanian myth, complete with plausible explanations and descriptions of their origins and physiology. So convincing are these creatures that the reader will turn the page with no concern about fact-checking. Indeed, this is a real page-turner, and I quite enjoyed it as such. But to get the most out of the story, and because I am by nature a fact-checker, I read it again, to sort through any inconsistencies and separate fact from creative license. Suffice it to say, many facts within Prouty s novel can be loosely linked to truths. In my opinion, this detracts nothing; rather, I am impressed with the author s ability to concoct such a believable pseudo-reality. For example, I believe the publishing house fire that destroyed Bram s intended prologue and epilogue was simply added by Prouty to existing rumors to frame the story. Bram did keep notes over the seven years he wrote Dracula, which now reside at the Rosenbach Museum in Philadelphia, Pa., while the one known typed Dracula manuscript is in a private collection on the West Coast. The closest thing to a prologue is the short story entitled Dracula s Guest, released after Bram s death. Bram s altered ending to Dracula, which appears in the typed manuscript, likely inspired Prouty s epilogue, because to date, no mention of any true epilogue has been found. Stoker s Manuscript illustrates the Dracula legacy: confounding coincidences of history, missing documents, and unanswerable questions about Bram Stoker s intentions. . I absolutely love reading, it's a passion of mine especially for vampire books. The writing style is superb. It's one of those books that once you start its hard to put down. Not many books do that to me so kudos to the author. It is well written and the ending leaves you thinking there will likely be a sequel?? Either way this I can easily see turned into a movie. It's definitely not your teeny vampire stories. Great job Royce, you have a new fan and I can't wait for your next one!